Often overlooked, web hosting is one of the key components of every successful website. Choosing the best WordPress hosting for your needs can improve your SEO and increase sales. There are various different types of WordPress hosting options available such as Free, Shared, VPS, Dedicated, and managed WordPress hosting. In this guide, we will help you choose the best WordPress hosting for your website. WPBeginner is the largest free WordPress resource site that receives millions of pageviews per month. Having helped 200,000+ users and years of experience with WordPress hosting companies, we know the importance of choosing the best WordPress hosting company. Our goal with this guide is to share our 12+ years of experience and insights on things you need to consider when choosing a hosting company for your business. To help you make the right decision, we have also done a side-by-side comparison of the top WordPress hosting companies including speed tests, uptime tests, and reliability test (scroll to see the full comparison). If you’re in a rush, then you can simply see the table below with our hand-picked list of best WordPress hosting companies. These companies are consistently the top WordPress hosting companies in the industry when it comes to quality and service. What are the WordPress Hosting Requirements? Due to the popularity of WordPress, all best web hosting companies come with easy 1-click install options for WordPress. All WordPress hosting companies that we have listed in this guide offer full support for running a WordPress site. Speed, security, and reliability are all important factors that you need to consider when choosing your WordPress hosting. However, the most important factor that you should consider is “Your Needs”. Evaluating your needs before purchasing your WordPress hosting can save you hundreds of dollars. As we have mentioned above, there are different types of web hosting options available such as Free, Shared, VPS, Dedicated, and Managed. Let’s take a look at each of these options to determine which is the best solution for you. There are free web hosting available, but almost all of them have some sort of catch. Usually, you can find free WordPress hosting being offered in online forums or small groups. In most cases, these are managed by an individual who is reselling a small part of his server space to cover up some revenue. Often the catch is that you have to put their banner ads on the site. Some may ask you to put a text link in the footer of your site. These folks will sell that banner ad or text link to cover up the cost of your free space along with pocketing the profits. The biggest downside of having a free host aside from the ads is that they are unreliable. You never know when this person will stop offering the free service. They can leave you hanging at any time. If you are serious about your website or business, then avoid Free WordPress hosting at all costs. Shared hosting is by far the most popular type of WordPress hosting used by beginners. It is the most affordable and quite frankly a good starting point for new users. Shared hosting is where you share a large server with a lot of sites. By having multiple sites on the same server, hosting providers can offer the service at a more affordable rate. The biggest catch that we see with shared hosting across all providers (including the ones we recommend below) is the unlimited resources. There is no such thing as unlimited. While it says unlimited, you still have usage restrictions. If your site starts to take up substantial server load, they will politely force you to upgrade your account. If they don’t take this action, then it can have a negative effect on the overall performance of other sites hosted on the same server. It gets back to conventional wisdom. As your business grows, so will your overhead cost. Shared web hosting is the best solution for small businesses and starting bloggers. Virtual Private Server (VPS) refers to a virtual machine. It is a method of partitioning a physical server computer into multiple servers with respect to the individual customer’s need. Even though you are sharing the server with a handful others, this gives you almost as much control as a dedicated server. It also has the privacy of a separate physical computer and can be configured to run specific server softwares. Often developers, intermediate users, and medium-sized bloggers utilize VPS to scale their websites. If you do NOT have any technical knowledge, then you need to make sure that you purchase a managed VPS. This means that the WordPress hosting provider manages all system upgrades, and they are available to assist you if needed. VPS hosting is best for medium-sized businesses, high traffic blogs, and aspiring designers/developers. Dedicated server is a physical server that you can lease from the hosting provider. This allows you to have full control over the server including the choice of operating system, hardware etc. You DO NOT need a dedicated server if you are just starting out. Once your site is receiving a significant amount of traffic, only then you should consider upgrading to a dedicated server. WPBeginner runs on a dedicated server by HostGator. If you do not employ a system administrator or have no experience with servers, then we recommend that you get a managed dedicated server. WordPress hosting providers who offer managed dedicated servers employ full-time system administrators that maintain your servers. Along with doing software updates, they also do server monitoring, offer phone support etc. Most top websites use clusters of dedicated servers. WordPress Dedicated Servers are best for extremely high traffic blogs. Due to the large number of users using WordPress, several web hosting providers have chosen to offer managed WordPress hosting. An account with one of these providers only allows you to host WordPress based sites and nothing else. The benefit of managed WordPress hosting is that you do not have to worry about ANYTHING. They optimize your site for performance, make sure that your site is secure, and keep regular backups. On top of that they advise you if a specific plugin is having a negative impact. Bottom line, managed WordPress hosting is hassle free fast WordPress hosting with high-quality support from staff with lots of WordPress experience. While all this sounds amazing, the plans for managed WordPress hosting is usually on the higher end of the scale. For example a personal account with a popular managed WordPress hosting provider costs $29/month where you can only host 1 site (getting maximum of 25,000 visitors per month). The next level higher where you are allowed multiple domains will cost you $99/month. A person starting out a blog cannot afford this. Managed WordPress hosting is great for established bloggers who can justify the expense with their revenue. It is for people who do not have the skills/time to deal with the technical side of things. We recommend WP Engine for managed WordPress hosting. Now that you know all of your WordPress hosting options, it is time for you to make a decision. We run several sites that get millions of pageviews per month. We have tested and worked with all top web hosting companies in the industry. After having helped 200,000+ users and years of experience, our founder Syed Balkhi have personally hand-picked some of the most well-reputed WordPress hosting providers for you. Each of these WordPress hosting companies provide excellent service and support. We give each of them a perfect 5 out of 5 star rating. Check out the list of best web hosting providers. One of the oldest web hosts started in 1996, Bluehost has become the largest brand name when it comes to WordPress hosting. They are an official 'WordPress' recommended hosting provider. With Bluehost, you never have to worry about your website being slow even when there is a lot of traffic. Their 24/7 expert support is always there to help when you need it by phone, email, or live chat. They are rated #1 in web hosting for small businesses. On top of that, they are offering WPBeginner users an exclusive 63% off discount, a Free Domain, Free SSL, and a free Site Builder with templates. HostGator hosts over 8 million domains and is one of the most popular web hosts in the industry. With 1-click WordPress installation, 99.9% up time guarantee, and 24/7 support, it's a smart choice for every website owner. WPBeginner is a proud HostGator customer since 2007, and our website is hosted on HostGator dedicated servers. We consider them the best web hosting for businesses. SiteGround is one of the most popular and highest rated hosting provider in the WordPress community. They provide unique in-house WordPress speed and security solutions to make your site as fast and secure as possible. They are known for the best 24/7 support in the industry which is why they're an official 'WordPress' recommended hosting provider. SiteGround features include automatic upgrades, built-in WP caching, CDN, one-click staging and GIT version control. They are also one of the few companies offering location specific hosting with 3 data centers in USA, Europe, and Asia. On top of all this, they have а special 70% discount for WPBeginner readers. InMotion hosting has been a well-known industry brand with reliable performance for business class hosting. With award winning technical support and 99.9% uptime, they are a user favorite. Their unmatched U.S. based support is always there to help. InMotion Hosting's WordPress Hosting is optimized for active bloggers and offers great scalability for your blog's growth. They're offer our users an exclusive 57% off + free domain and free SSL. Now after browsing through the top WordPress hosting companies listed above, you might still be wondering which one is best for your business? Our goal is to help you make the right decision because choosing the wrong provider can have a negative impact on your website SEO, speed, and sales. It’s quite easy to get overwhelmed with all the information overload. Often users read this guide, and email us asking for personalized recommendation on which WordPress hosting is best for their needs. To help expedite this, we have created a WordPress hosting recommendation engine that can help you decide which is the best WordPress hosting for you based on your needs. If you still want personalized help in choosing the best WordPress hosting provider, then please send us a message using our contact form. One of our team members will respond within 24 hours. One of the reasons why WPBeginner is the most trusted WordPress resource site is because our reviews are based on actual data and experience. Unlike other WordPress hosting review sites who just steal words straight from press-releases of respective hosting companies, we actually sign up with each individual WordPress hosting provider and thoroughly test their services. 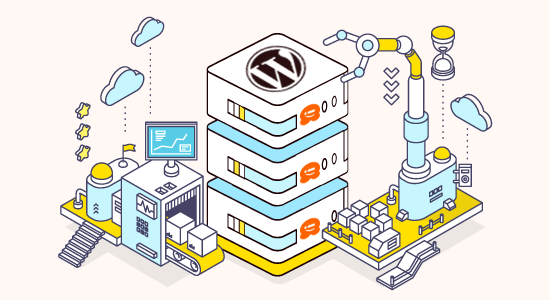 We use independent third-party tools like Pingdom, LoadImpact, and Bitcatcha to test the performance and reliability of each company, so we can help you choose the best WordPress hosting for your business. To accurately measure performance across all WordPress hosting companies, we create a sample WordPress site on each hosting provider and install the default Twenty Seventeen theme. Next, we import dummy content including images and media so our test resembles an average user website. After that, we use Pingdom, an industry leading website speed test service, to measure our sample website speed across multiple hosting companies. We also use Load Impact service to send virtual users (VU) to each website to see how the hosting server would handle increased requests from multiple connections at once. This helps us see how the individual WordPress hosting company would perform during peak traffic times. Last but not least, we use Bitcatcha service to test server response times across numerous geographical locations including United States, London, Singapore, Sao Paulo, India, Sydney, and Japan. This helps us decide which hosting company is best for which geographical location. Now that you know our test process, let’s compare the performance of the best WordPress hosting companies. Bluehost is one of the largest hosting companies on the planet, and they are an official WordPress recommended hosting provider. As you can see, our test site loaded in less than two seconds. That’s faster than 85% of all tested websites. Considering the fact that our sample website wasn’t using any caching plugins or speed optimization tips, this result is very good. After the speed test, we ran the Load Impact test on Bluehost servers. We gradually built up to 100 unique visitors at once to see how the server would handle increased requests from multiple connections at once. 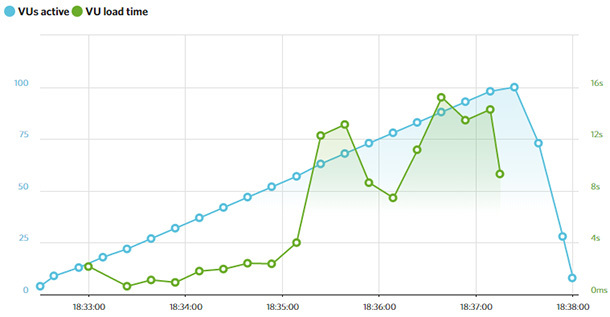 The blue line is the number of active virtual users on the site, and the green line is the server load time. As you can see the server load remained stable through out the test even at peak traffic. After the load impact test, we used Bitcatcha to test more accurate server response time from various geographical locations. The Bluehost server performed exceptionally well in the United States loading under a fraction of a second. In other locations, response was a bit higher but still under less than a second. If your target audience is in the United States, then this would hugely benefit your website. In our detailed Bluehost review, we also evaluated their customer support, features, and pricing. After our analysis, we rate Bluehost as the #1 WordPress hosting provider for small businesses to make a website. HostGator is a popular web hosting company that hosts over 8 million domains. WPBeginner website is hosted on HostGator dedicated servers, and we have been using them since 2007 for our various websites. As you can see, our test site loaded in just under a second for a server in Dallas, Texas. That’s faster than 94% of all tested sites. Considering the fact that our sample website wasn’t using any caching plugins or speed optimization tips, this result is amazing. But how does HostGator perform when you have a lot of traffic? We ran the Load Impact test on HostGator servers where we gradually built up to 100 unique visitors at once to see how the server would handle increased requests from multiple connections at once. The green line represents page load time and the blue line represents number of users on the site. As you can see, our test site performed really well up to 80 users, after that it started to slow down. These results are normal for shared hosting accounts because you share server resources with other sites hosted on the same server. As your site grows, you need to move up to VPS hosting or even managed WordPress hosting. The HostGator review site server performed really well. The server response time remained less than a second. In the United States, it was merely 37 ms. In our detailed HostGator review, we also evaluated their customer support, features, and pricing. After our analysis, we find HostGator to be a great option for growing businesses because they offer plans that grow with your business. SiteGround is one of the most popular and highest rated hosting provider in the WordPress community. They provide unique in-house speed and security solutions which is why they’re an official WordPress recommended hosting provider. Next, we ran the Load Impact test on SiteGround servers where we gradually built up to 100 unique visitors at once to see how their server would handle increased requests from multiple connections at once. Our SiteGround test site server performed really well in the United States and all other locations with the exception of Japan. If your audience is in Asia, then you can ask SiteGround to move you to their Asia-Pacific servers to remedy this. In our detailed SiteGround review, we also evaluated their customer support, features, and pricing. After our analysis, we find SiteGround to be a great option for beginners because their support is incredibly helpful. PROS: Best WordPress support, good uptime, fast speed, and free SSL. InMotion hosting has been a well-known industry brand with reliable performance for business class hosting. They offer award-winning 24/7 U.S. based support. As you can see our test site loaded in just under a second for a server in Dallas, Texas. That’s faster than 90% of all tested sites. Since the test above only measures the load time with single user on the site, we used Load Impact to test how InMotion hosting servers would perform during peak traffic hours. We gradually built up to 100 unique visitors at once to see how their server would handle increased requests from multiple connections at once. As you can see that our test site performed well until it reached 25 users. After that it slowed down as traffic kept increasing. This is normal for shared hosting where your website shares resources with other websites hosted on the same server. But some hosts do a better job of resource allocation than others. For all locations, InMotion Hosting responded under a second. The response time was slightly higher for locations in Japan, Brazil, and Australia. If your websites’ target audience is in the United States and/or United Kingdom, InMotion Hosting is a fast and reliable host. If your target audience is located outside these regions, then you might benefit from finding a server location near those regions. In our detailed InMotion Hosting review, we also evaluated their customer support, features, and pricing. After our analysis, we find InMotion Hosting to be a great option for businesses who value U.S. based support. Their plans grow as your business grows. PROS: U.S based support, good uptime, and free SSL. CONS: No free domain and No instant activation for people outside U.S.
DreamHost has been around for 18 years and is known for their reliable web hosting. They are also an official recommended WordPress hosting provider. As you can see our test site loaded in just under a second for a server in New York City. That’s faster than 93% of all tested sites. After the speed test, we ran the Load Impact test on DreamHost servers to see how it would perform during peak traffic hours. We gradually built up to 100 unique visitors at once to see how the server would handle increased requests from multiple connections at once. The DreamHost server performed well in the U.S loading under a fraction of a second, but in other locations it was slightly slower. Overall, DreamHost is a great host for websites in any geographical location. In our detailed DreamHost review, we also evaluated their customer support, features, and pricing. After our analysis, we find DreamHost to be a great option for businesses who value privacy. They offer free domain privacy with each of their domains. They also recently fought the U.S. department of Justice to protect the privacy of one of their customer’s website. PROS: Good speed free SSL, free domain with privacy protection, and 1-click WordPress install. CONS: More expensive than every other host in this list. Now that you have seen the performance comparison of the top WordPress hosting companies, it’s time to decide which is the best for your business. For your convenience, we have created a table with a side-by-side feature list, so you can easily compare the best WordPress hosting companies. In our in-depth WordPress hosting review, we came to a conclusion that if you are looking to start a blog, then you cannot go wrong with Bluehost. The fact that they offer you a free domain and free SSL for the price of $2.75 per month, it’s very hard to beat. But truly, you can’t go wrong with any of the top WordPress hosting companies that we have mentioned above. They all offer great uptime, fast servers, quality support, and extremely low prices. Having helped over 100,000+ users start their website, we have answered quite a lot of questions. Below are some of the answers to the most frequently asked questions about WordPress hosting. Do I need WordPress hosting to start a website? If you want to build a WordPress website, then you need web hosting. Your hosting server is where your website files are stored. Every website that you see online uses a web hosting provider. Are there any free WordPress hosting providers? There probably are, but we highly recommend that you stay away from them. In most cases, free WordPress hosting providers put advertisements on your website. They may even distribute malware to your users. Last but not least, they can shut down your website at anytime without any notification. Avoid anyone who offers to give you free WordPress hosting, specially if you are serious about your site. The cost to build a WordPress website varies based on your needs. It can range from $100 to as high as $30,000. We have created a detailed guide explaining how much does it really cost to build a WordPress website. Do I need to have my domain and WordPress hosting from the same provider? No. You can purchase your domain from a provider like GoDaddy and use one of the WordPress hosting providers listed above. However if you don’t have a domain already, then it’s easier to use the same provider (specially if its free). Can I use these WordPress hosting providers for an eCommerce site? Yes you absolutely can. All WordPress hosting companies that we recommend offer SSL certificates which is what you need for running an eCommerce website. Most of the WordPress hosting companies listed above offers free SSL with your account. Your web hosting account is where your website files are stored. So it’s very important that you secure it. The best way to secure your WordPress hosting account is to use a strong password and avoid logging in from public locations (unless you’re using a VPN). We also recommend that you follow our ultimate WordPress security guide to protect your site. How do I install WordPress on my WordPress hosting account? Every WordPress hosting provider that we recommend comes with 1-click WordPress install. You can follow our step by step guide on how to install WordPress on your host. Do I need a cPanel WordPress hosting? cPanel is a type of control panel that a lot of WordPress hosting companies use. No you do not need cPanel, but it does make things easier in terms of installation, managing email accounts, etc. How much traffic can these WordPress hosting companies handle? These WordPress hosting companies handle billions of impressions a month. The amount of traffic your website can handle really depends on the WordPress hosting plan that you’re on. Most shared hosting plans can comfortably handle 1000 to 2000 visitors per day as long as your website is optimized for performance. As your website grows, your WordPress hosting provider may ask you to upgrade to either VPS hosting or managed WordPress hosting plans. Yes, you can absolutely switch if you’re unhappy with you WordPress hosting company. Most WordPress hosting companies offer free migration services which makes the process fairly smooth. However if you want to do the migration yourself, then you can follow our step by step guide on how to move WordPress to a new host with no downtime. Does my WordPress hosting datacenter location matter? Some of the WordPress hosting companies that we recommend give you an option to choose your data center. The location of your data center does make a difference on your website performance for specific geographic location. If majority of your audience is in United States, then you want to choose a data center in U.S. If a large portion of your audience is in Europe, then you should choose a data center in Europe. If you are not sure, then just choose U.S for now. You can always use a WordPress CDN to speed up your site for various geographic location. Should I purchase monthly WordPress hosting plans or commit long-term? You will notice that almost every WordPress hosting company offers huge discount for choosing long-term plans. If you are serious about your website, then you will likely keep it for more than a month. We always recommend against choosing monthly WordPress hosting plans because they cost almost twice as much. It’s a better deal if you choose 12 month or 24 month plan. Often WordPress hosting companies will try to upsell you on a wide-variety of services. You really don’t need these services when you’re starting out. We recommend that you uncheck everything in the order process and only purchase what you really need: WordPress hosting. You can buy WordPress hosting addons if you need them in the future. Do WordPress hosting companies offer professional branded email address? Yes, most WordPress hosting companies will give you the ability to create branded email address. However we recommend that you use Google Apps (also known as GSuite) because it’s more reliable. See our step by step guide on how to setup a professional email address with Google apps. Do these WordPress hosting companies offer website backups? Yes, every WordPress hosting company claims to keep backups of your website. However from our experience, we advise our users to install a WordPress backup plugin and keep their own backups. Which are the best WordPress hosting companies in your opinion? Bluehost – Best overall WordPress hosting. HostGator – Best WordPress hosting for growing businesses. SiteGround – Best WordPress support in the industry. No this last question is not a joke. We seriously get this question even after referring people to this guide. We hope that this guide helped you choose the best WordPress hosting for your website. If you have a WordPress hosting question that we didn’t cover, then please send us a message using our contact form. One of our team members will respond back within 24 hours. Need helping start your WordPress blog? Take advantage of our free WordPress blog setup service. I use SiteGround’s WordPress Hosting and the GoGeek package. It’s absolutely brilliant for speed and this is so important these days. It performs well when testing with Pingdom and Google PageSpeed. It also provides daily backups and a staging feature which lets me create a copy of my live site which I can switch around quickly. Thanks for the suggestions!! I bought my hosting space from another host, where I feel very comfortable with their reliability and Especially support. May be I would consider picking one from these list, if I am looking for a move. Hi, you’ve got a typo in InMotion Hosting. Pros: 90 days monkey back guarantee. is it possible that when the term is overwith godaddy i can change my hosting to bluehost? Great article, wish I had read it earlier. I bought hosting from Hostnoc, but it is really good. Your list consists of good hosts too. Great suggestion.